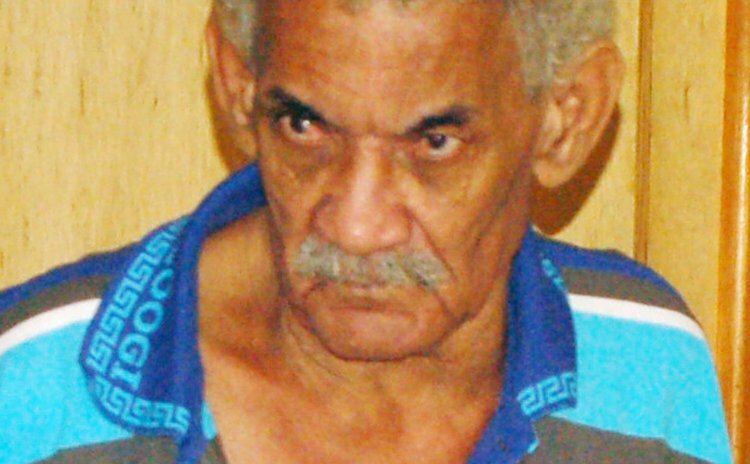 The trial of Edward Green, 70, of Morne Daniel for the murder of Damian Dorival, 35, of Roseau went into its fifth week but it was suspended following a fire alarm on the morning of Monday July 8, 2013. Chief prosecutor, Keith Scotland of Trinidad & Tobago, had announced on Friday July 5, 2013 the closure of his case against Green after Police Inspector Robertson Laurent had spent three days on the witness stand. Green who was being defended by lawyers Peter Alleyne, Darius Jones and Vincia Auguiste was expected to make his defence, if he chose to, on July 8. Earlier Alleyne recalled Nesty after his lengthy cross examination of Inspector Laurent which spanned two days. The gist of Alleyne's application was that he had been apprised of information that week that a car which was on Green's property at Morne Daniel had been taken to a car wash with blood on it. Nesty said he discovered a finger print on his vehicle weeks after Dorival's death and had informed Inspector Martin Desmond Austrie of the finger print. He thought the print might have been his when he was re-examined by Scotland. It was on that note that Scotland closed the State's case, 30 witnesses later, over nine days, from June 17 to July 4, 2013. A few minutes after court began on Monday July 8 the lights in the courtroom flickered and faltered and a bailiff announced that there was a fire in the building. Near pandemonium broke out aided and abetted by some of the police officers in attendance because of their hustling of court attendees including the jury and registry staff to vacate the building in a rush, under rain. Later it was discovered that outside the Roseau High Court building a utility pole loaded with wires on the south east corner of Hodges and Long Lane was the culprit. Registry staff and courtroom personnel were shepherded to the nearby Public Service Training Centre. With Tropical Storm Chantal nearing the Eastern Caribbean Green's trial was postponed to Monday July 15. Before the unscheduled interruption, Inspector Laurent told the court that on Thursday June 12, 2008 he visited the scene where Dorival's body had been seen near the UWI facilities, with Inspector Martin Desmond Austrie and other police officers about 12:30pm. By then Dorival's body had been brought up to the road from the precipice where it was first spotted by Franki Sheldon Carter of Canefield and another schoolboy. There were bloodstains in the vicinity of the body, and Austrie took photographs of the evidence. At 2:10pm, Laurent and Austrie and other police officers went to the accused's home. Inspector Laurent spoke with Corporal Julian Laurent of the Mahaut Police Station about 2:17 and Laurent and a police constable arrived at Morne Daniel with the accused abut 2:32pm. The inspector informed Green of the investigation. He replied that he had not seen Dorival in two weeks. Asked about a firearm, Green said it was in the bedroom and led the police to his room where he retrieved a silver and black rifle from under his bed. He gave the police inspector a container containing 66 rounds .22 ammunition. Asked about his whereabouts on Wednesday 11th June 2008, Green said he had gotten to his home about 9:00pm after being given a ride by Jerry Abraham and had not left until 9:30am the Thursday morning. He got a drop to the bus stop and a bus dropped him at his home. To another question, Green replied that he would be a mad man to kill someone on his property. Laurent took Green to Police Headquarters and about 6:45pm he took a statement from David Green, Edward Green's son. Laurent and Austrie next stop was Virgin Lane where Dorival's rental vehicle was located. That same Saturday Laurent went to Copt Hall and saw Dorival's head in the river between two stones. Laurent took statements from Deon and David Green and Ernest Nesty in the presence of the accused and his lawyer on Saturday June 14, 2008. The accused told the police that he did not kill Dorival. He had no problems with him. He stated: If I kill a man it would be difficult for you to get the body. Dorival did not pay his rent on time, but he had only $350 for him. He said during these confrontational interviews that he had seen Dorival on Monday before the incident in Mahaut driving a blue jeep. He was sitting on the steps by his home. Green denied everything that everybody said. The police went back to the Edward Green's house at 6:30pm. Deon showed where he was when he heard the shots the night of Wednesday June 11, 2008. Inspector Laurent charged Green on suspicion of murder on Sunday June 15 about 9:00am.